Why you clicking your mouse so much? Seriously please do this for me. 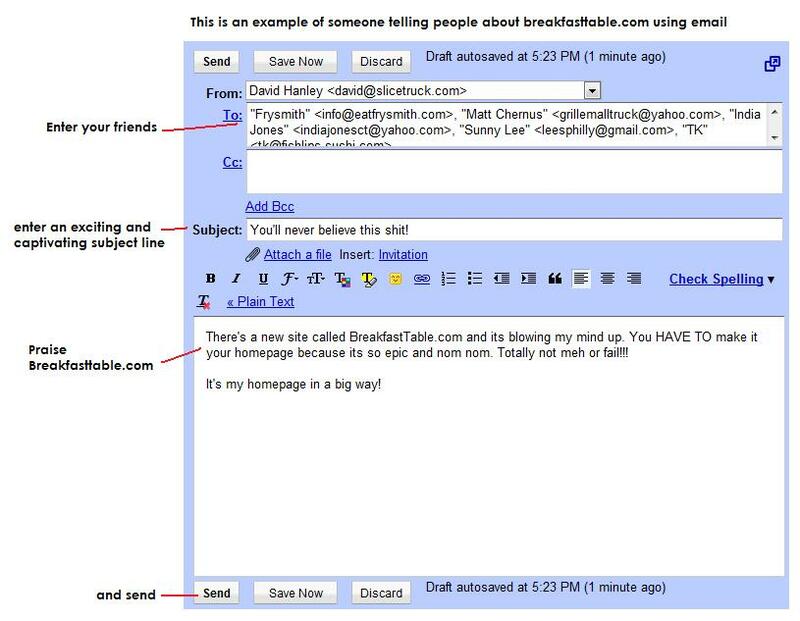 Set your homepage to breakfasttable.com. It's a pleasant and convenient homepage. Ok, I can tell you're not taking me as seriously as I'd like. If enough people start using breakfasttable.com on a daily basis SliceTruck will give free pizza away everyday forever. I know people like to be a part of something big and this is your opportunity. Here are the steps. 2. 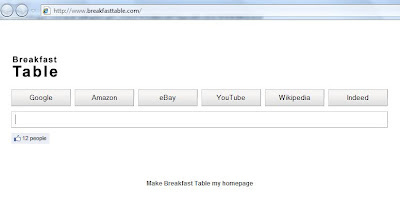 Set breakfasttable.com as your homepage. If you're on Firefox or Chrome you will need to click settings and options. On explorer just click the link that says to set as homepage. 3. Go to your Facebook account and post this as your status: I just set BreakfastTable.com as my homepage and I think you should too. 4. Repeat steps one through three but swap Facebook with email, twitter, linkedin, yahoo personals, etc. etc. If you really want to support SliceTruck please set BreakfastTable.com as your homepage. Wouldn't it be fun to make us rich and successful? Seriously if you do that for us we'll give away free pizza 6 days a week forever. Even if it gets just a little successful we'll start giving out free pizza one day a week all day. 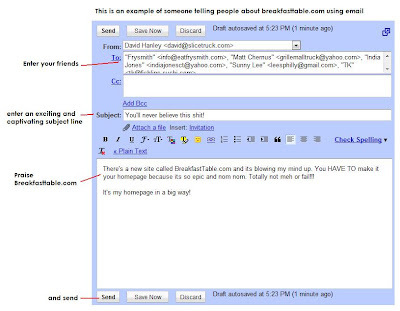 Point is that by doing something that is great for you (setting your homepage to BreakfastTable.com), you can give a lot of people a free slice of pizza. What is mildly successful? I'd guess that it would be getting 20,000 American people to use Breakfast Table on a daily basis. If this were to happen we'd give out approximately 10,000 free slices of pizza per month. Every Monday from 11am-12am we'll give pizza away as fast as possible in a different part of LA. As it grows from there we'll add Tuesday, Wed, New York, Chicago, so on and so on. Breakfast Table could be the Robin Hood of the internet, turning search engine traffic into free pizza from SliceTruck. You know why else this would be fun? Because it would be funny. Funny interesting if it actually worked. "....turning search engine traffic into free pizza from SliceTruck."